We are starting with this amazing Carpina Home Oak White 3-Piece Ladder Shelf Office Desk Set – Style # 9X411. Check out all Cabinets and Storage here. It will be perfect for displaying all of his LEGO creations and also for storing toys in baskets and bins. He is most excited about the desk, which he is referring to as his “Crafting Table,” something all you Minecraft mamas will appreciate. We have already painted two walls in Rainstorm/Matte by Sherwin-Williams. It transitions nicely to the light aqua on the other walls and in the adjoin bathroom. By painting just two walls, we kept cost down and kept the room from getting too dark. For lamps, we went with two that featured USB outlets on the base. This is perfect for charging his favorite nightlight and his tablet both at his desk and on his nightstand. 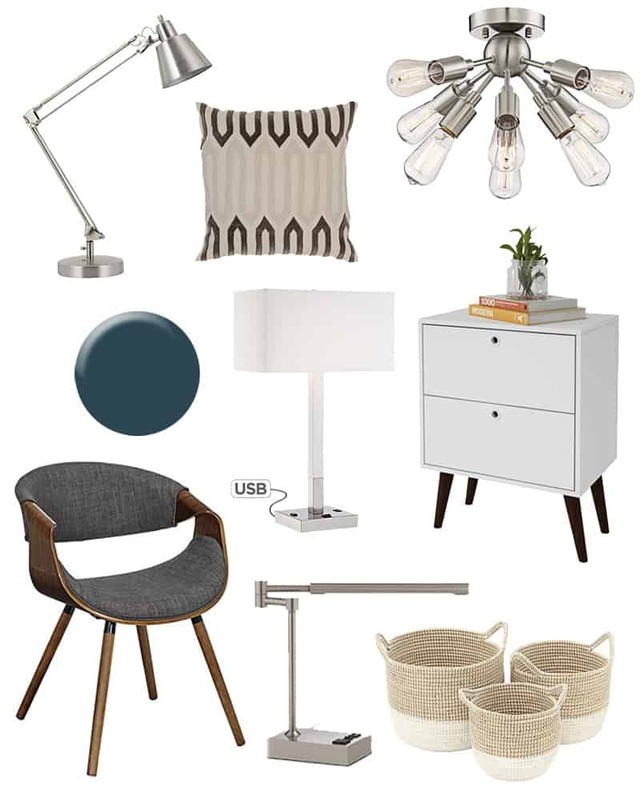 We also loved this chic Udbina Adjustable Architects Desk Lamp – Style # 5N881. For the nightstand, we went “modern” with this Taby White Wood 2-Drawer Nightstand – Style # 9X343. It also comes in bright yellow, which looks fabulous. You can see all of the Nightstands here. On the ceiling we are replacing a good-for-nothing ceiling fan that blows an $8 bulb every three weeks with this gorgeous ceiling fixture. There are so many beautiful options like this Hemingson 8-Light Satin Nickel Ceiling Light – Style # 8Y695. As a desk chair we wanted something that was comfortable but also stylish. I’m excited about this Butterfly Charcoal Fabric Accent Chair – Style # 9G276. It might magically disappear from Gordon’s room and appear in my office. 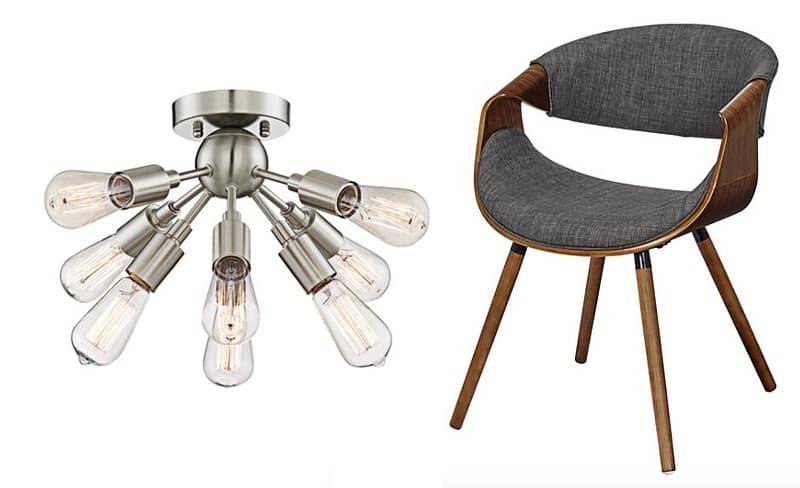 All of the Lamps Plus seating options can be seen here. For beautiful pillows and throws to make a bed or reading nook cozy, check out the collection of Home Textiles. There are so many beautiful solutions. Stay tuned as we finish up Gordon’s new digs just in time for the holidays. Why do I do this to myself? Thank you Lamps Plus for providing beautiful products for our boy’s bedroom makeover! That is one fancy bedroom for your son … love the attention to style! We will see how we feel when it’s full of legos haha! Want all the things. Including a little boy 🙂 Can’t wait to see the reveal!